This is a guest post by Andrij M. Hlabse, SJ, who was in Brazil for Magis and World Youth Day 2013. With apologies for the delay between posts, I would like now to offer a look inside some of the smaller and inspiring details of World Youth Day. Certainly, by now we have probably seen (even those of us who were there!) 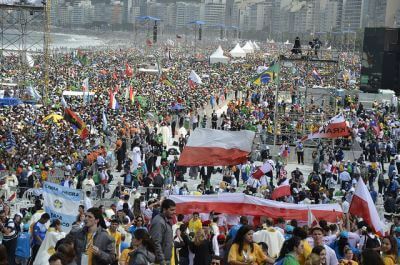 the panoramic photographs of Copacabana Beach and the papal events. Sunrise on the Atlantic coastline, three million fellow pilgrims, the Holy Father, the Mass”¦what an inspiration and source of awe! Yet those captivating still frames cannot show some of the little lived details in which World Youth Day and the Church come to life. Here are three highlights from my time in Brazil that the cameras probably could not have captured. First, the flags. I imagine this was a significant part of the media coverage; however, a moment stands out. On Saturday, before the papal vigil at Copacabana, I was at Botafogo beach with some fellow pilgrims. Those who were already making their way to Copacabana walked along the closed roads on this official route. We actually waited there searching for our own groups for hours. But in each of those hours nations went by, one after the other. It was an absolutely non-stop flow of the variety of the universal Church marching along in a train of millions of people peacefully walking, singing, dancing, and praying. I saw pilgrims from Brazil, France, Nigeria, the United States, Argentina, Poland, Spain”¦What is amazing is that many of these people were acting this way having come directly from a multi-hour wait for their food supplies for the vigil. Second, the warmth of the Brazilian people. Pope Francis highlighted this topic, and my own experience bears it out. In particular Vânia stands out to me; she was the arts teacher at the Jesuit high school that was our group’s home in Sâo Paulo. Vânia selflessly led our group each day during our experience there. She organized us pilgrims, conducted the art class for the children at the day care, in which we all participated, and facilitated our trips to local sites. Then she would be with us for an evening reflection and meal. Her days had to be well over 12 hours. This is not to mention the impromptu lessons about Brazil and tour of the high school which she also gave us. 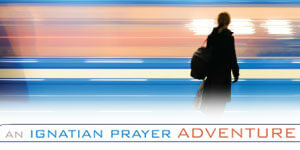 Behind any Christian initiative stands this heroic kind of generosity. Finally, I would also like to highlight a young group of Brazilians whom I met at the papal vigil at Copacabana. They saw me alone (I had been separated from my group.) and offered me a seat, in spite of the fact that space was at an absolute premium and that I would likely get their belongings sandy. One young man in particular offered to answer in English any questions I had about the speakers and insisted that I not be shy about sharing their snacks—M&Ms and nuts were on offer. We conversed about their group of pilgrims and its local apostolate in Brazil. They were over 100 members strong. Finally, as the event concluded and pilgrims began to eat their meals on the beach, they invited me to share their dinner with them. Although I had to decline their request so I could return to our home base, this encounter cemented for me the experience of the heart of the Brazilian people I had felt all pilgrimage long. Image by JMJ Rio 2013 under Creative Commons license. Andrij Hlabse, SJ, was born in Cleveland, OH, where he attended St. Ignatius High School. After studies at the University of Notre Dame, Andrij entered the Society of Jesus in 2007. With a background in both Latin and Eastern Catholicism, Andrij's interests include philosophy, Patristic and liturgical theology, and linguistics. Thankyou for your WYD commentary. Takes me back to the warmth & spiritual hospitality I encountered in Denver 1993. If you heard of or experienced any miracles could you relay them please? Thank you for sharing these stories with us. Watching WYD events on the internet was a very moving experience; as I watched the Adoration and then saw the people at the closing Mass, I knew that this amazing group of people with the leading of the Holy Spirit have the power to change the world. I pray that each person at WYD and each person moved by the events will commit to following the will of God in their lives and will have the joy of a deep relationship with Jesus.